Don’t get too excited. This photo was taken last year. We’ve had a stretch of weather that seems ideal for morel mushroom fruiting here in Northern Illinois, and I took a quick look around a couple patches close to my home today. – The springtime flora seem to be getting off to a slow start. Mayapples are barely out of the ground, same with Trillium. I’ve not even seen a Jack in the Pulpit. In my experience, morels show up when these plants are well underway in their growth. To see what I mean, look at my post from 2011, which documents my first morel finds, as well as the growth stages of other springtime woodland plants. – No pheasantback fungi to be seen anywhere. By the time the morels are fruiting, pheasantbacks are well established and about the size of a saucer. In my tramp through some elm woods that are host to many pheasantbacks, I didn’t even see an emergent bud of this widepread mushroom. – Evenings have still been pretty cool. I don’t think the ground has warmed up sufficiently yet. – No one else has found any in this area, either. I’ve been checking various morel progression maps and the closest find so far this year was in Springfield. Hundreds of miles south of me. So, there you go. Temperatures are set to dip again and stay cool for a while toward the end of this week. My bet is that it will be a good couple weeks before we see morels in northern Illinois. Update 5.2 – I went out this morning and took my time looking around a few good spots. Finally saw a pheasant back bud but no morels. With the cold weather that’s coming in today, I think we’re at least a week away. 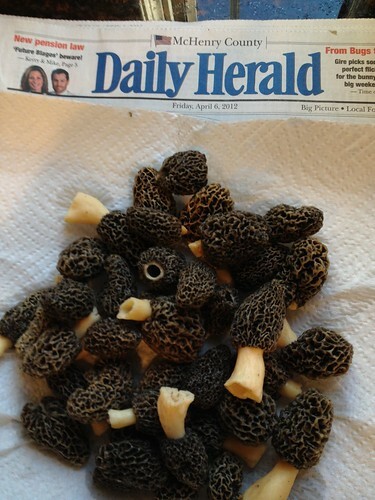 This entry was posted in edible wild mushrooms and tagged morel mushrooms 2013, morels. Bookmark the permalink. Thanks for this information Sarah, I’ve never gone for Morels and am not sure when to go. I have been going for the Fall button and sheep head mushrooms for 60 years now and I understand that there are morel like mushrooms that are poisonous, that is why I am a little leary about going for them. I live in Hickory Hills Il, about 20 miles southwest of Chicago, thanks again. Don’t worry. The mushroom they’re talking about really looks nothing like a Morel. I believe it is gomphrya…..something like that. If you look at pictures on web you will definitely see the difference . If you live in central IL they should be popping in 2-6 days. Happy hunting. I found some pheasant backs today in mundelein il. Still no morels. I finally saw a pheasant back this morning – just a tiny bud. No morels here either! The incoming cold front will slow things down. Bet it will be at least another week before we see any.